These are my “everyday tools ” – brushes, heavy duty paper towels (found in automotive aisle at Canadian Tire), spray bottle with water to keep my acrylics paints wet. My staywet palette is in the corner with a red cover to keep the moisture in. Uncharacteristically, by the end of this session I had 5 brushes with paint on them. I was working fast because I still had a lot I wanted to do, but I knew I had to stop. Today was just one of those busy days. In the last hour of painting I was talking to the kids when they came home from school, took the dinner out of the oven etc, but you can’t tell that all of that was going on when you watch the video. I think it was about 4 hours, condensed into 20 seconds. I started painting late today because I was working on the computer all morning, updating documents & adding them to the Arts Council’s website, responding to e-mail and social media – both theirs and mine. When I stopped painting tonight, I posted the timelapse to Instagram & YouTube, ate dinner, did groceries, put away groceries & laundry & now I’m trying to write this post & share on the 30 in 30 before midnight. But that’s the only reason there are a bunch of brushes in the water. Usually I only use one at a time. And I would not leave them soaking in the water because it’s not good for the brushes. I was going to talk more about the other tools we use, because I don’t think most people envision painters with drills, hammers, wire cutters etc. But I’ll leave that for another day. Ok, so it’s taking longer than I hoped, in terms of how many days/painting sessions. Each day I estimate it’ll take two more days. Though it’s normal for me to take 3 days to a week on a painting this size depending on the amount of detail. The rush I’m feeling is really because I’m sure people are tired of seeing this painting all over my social media channels at this point. So, I’m not posting everywhere now. The truth is that these sessions are two to three times shorter than normal, but I’m very focused, and I’m standing and walking back and forth the whole time. So by the end of the session I’m wiped out! Tomorrow I’ll have to remember to wear my fitbit. Ok, stay tuned for tomorrow’s timelapse. In the meantime, you could also check out some of my other paintings. This weekend we celebrate the annual Culture Days across Canada, and I will be doing my part in Burlington, ON. On Saturday I will be setting up my tent to display my art in Civic Square (426 Brant St.) – in front of Burlington City Hall – from 11-4pm. Burlington Student Theatre will be creating a “Burlywood” atmosphere with theatre, music, dance, film and photography. It should be a fun time. I will also be working on a collaborative painting – inviting any and everyone to express themselves with a few brushstrokes – and at the end of the day I will do a draw, and the lucky winner will get to take home the painting! As a Culture Days participant I am required to provide an “activity” at each event, not just a display/sale. “Founded in 2009, Culture Days is a non-profit organization dedicated to building a national network of cultural connections devoted to providing Canadians with opportunities to participate in, and appreciate, all forms of arts and culture. Through an annual three-day national celebration each September, hundreds of thousands of artists and cultural organizations in hundreds of cities and towns come together and invite Canadians to participate in free interactive and “behind the scenes” activities to discover their cultural spirit and passion”. So, my activity for Sat is listed on the Culture Days website here. On Sunday, I will be in the lobby of the Burlington Performing Arts Center (440 Locust St.), from 1-4pm, as part of the Celebrate Burlington: Artist Showcase. 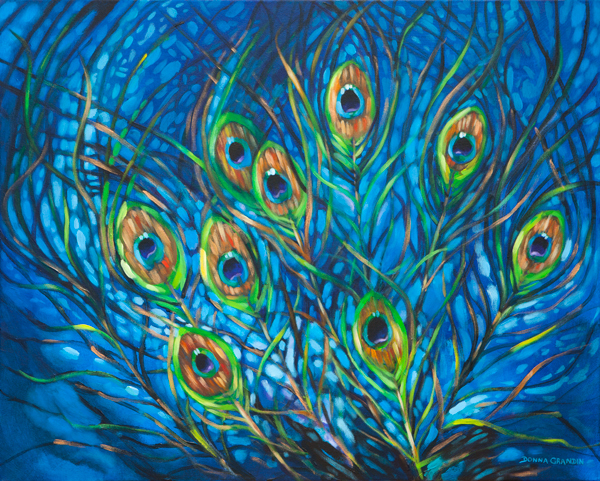 I will have a small display of my available paintings, and paper and pencil crayons for anyone who wants to practice drawing peacock feathers with me. See my event on the Culture Days website. Flow, 24″x30″, acrylic on canvas, ©2015 Donna Grandin. $1200. Started live in front of Burlington City Hall at Culture Days kickoff event in Sept 2014. Last year I had a fantastic time at the Culture Days event in front of Burlington City Hall, where our Mayor Rick Goldring helped kickoff the celebration with a clip of Burlington artists talking about Arts and Culture in Burlington – in which I was happy to have a 2 second cameo. That day I painted to live music, shared my art with the public, and enjoyed a celebration of the local arts scene. This year, there will be a lot of different arts professionals/organizations etc, but I think it will be equally exciting, so if you’re in the area, please come on out! Snippet from new postcard in the works! “The City of Burlington is working with the community to promote safe, active and healthy lifestyles in Burlington. A Car Free Street Festival brings families and neighbourhoods together, helps streets come alive with activity, and promotes physical activity for people of all abilities. I’ve generally stayed clear of exhibiting outdoors in the past, in fear of having my art out in bad weather. However in my volunteer work with the City of Burlington on the implementation of the Cultural Action Plan – with the vision of a vibrant community with a Cultural Department, an Arts Council, a healthy appreciation of the arts and thriving artists -I feel obliged to get involved. I realized that as an Independent Fine Artist I cannot complain about how hard it is to gain visibility in our city (beyond the Art Gallery of Burlington where I already have art available through Arts Etc. 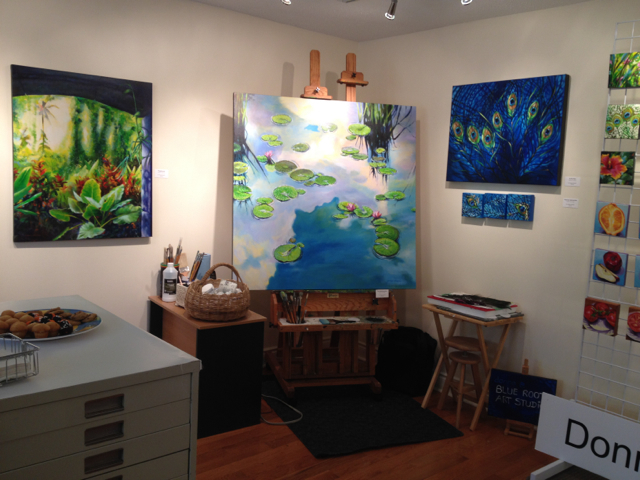 Gallery Shop & Art Rental) – the common complaint being that we live in a sleeper community and potential collectors turn to bigger cities nearby, unaware of quality art available locally – if I don’t take advantage of the opportunities the City is creating. That is why I painted on location in front of City Hall during Culture Days last September, and why I will be doing another acrylic painting demonstration in the Burlington Performing Art Center on September 27 for Culture Days this year. And that’s why I’m planning to buy a good WATERPROOF tent! 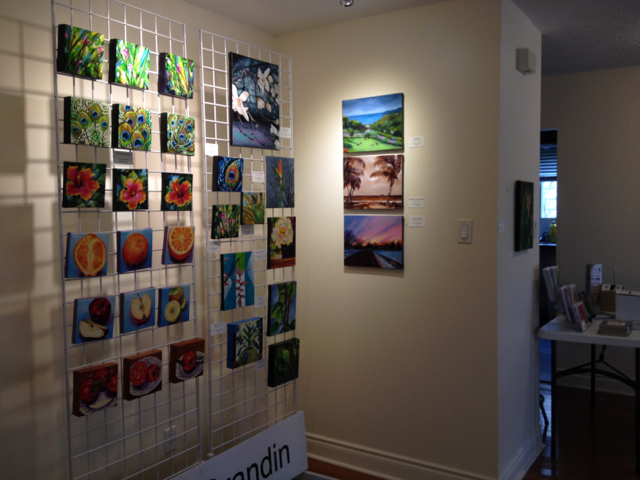 Oh, and did I mention I was juried into Art in the Park Oakville, Aug 3? So, yes … it looks like the tide is turning, and pretty soon I won’t be be fearful of exhibiting outdoors, I’ll have my very own war stories, I mean experiences to draw upon! It does seem to be a rite of passage for a Canadian Artist, and although a big part of my art practice is my tropical imagery, and I do have St. Lucian and Barbadian galleries carrying my Caribbean-inspired art, I am finally ready for a soft-launch of my new abstract series of peacock feather inspired acrylic paintings which reflect the part of me that straddles cultures and locations. So, if you are in the area … come by next Sunday, I look forward to your feedback! 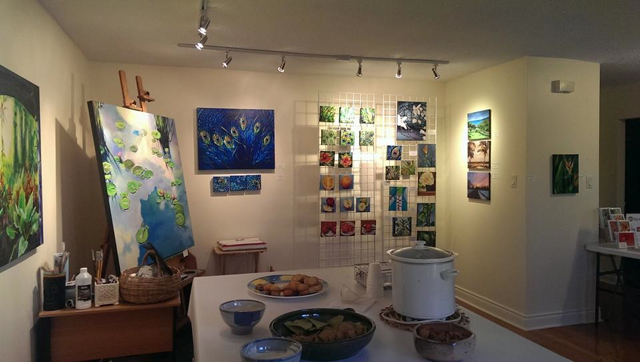 This year my studio was on the Art in Action Burlington Studio Tour for the 3rd time. 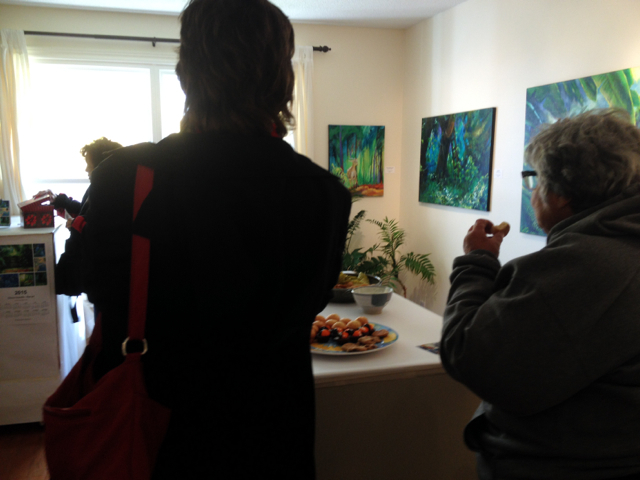 It was nice to see both new and familiar faces, and to have some great art conversations. Thanks to those of you who came from near and far – especially my supporters from Toronto, Whitby, Hamilton & Caledonia! Saturday morning was grey and windy … with the first snowfall of the season! 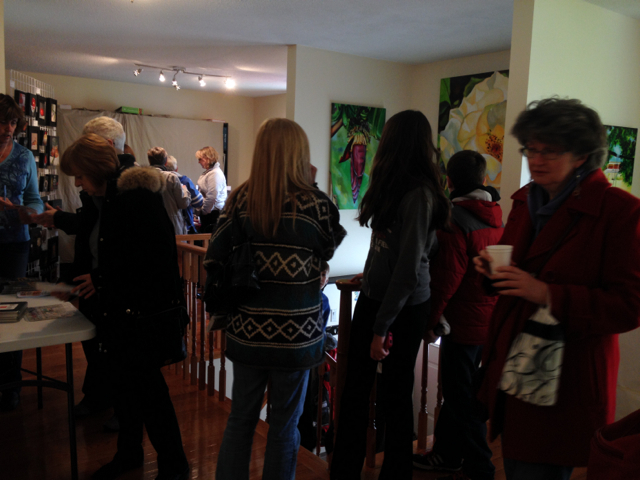 So, we had fewer visitors than last year, which was a pity. 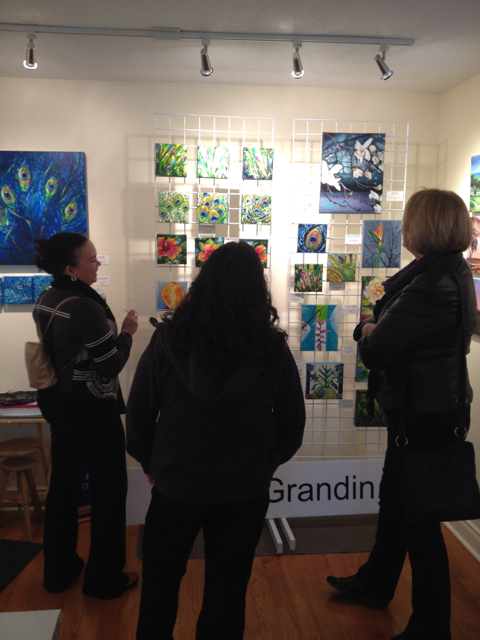 However, the first reports coming in are that sales were about the same as last year, so I guess a little snow and rain didn’t deter those who really enjoy visiting local artists in their studios and shopping for unique, hand-made items. The blue peacock-inspired painting on the top right was painted to live music during the Culture Days event in front of Burlington City Hall. It was very difficult to photograph (shiny), so I had a professional photographer do it. Then I had technical issues with my laptop and had to go without it for a few weeks, but I still plan on doing a blog post about the Culture Days event later this month. 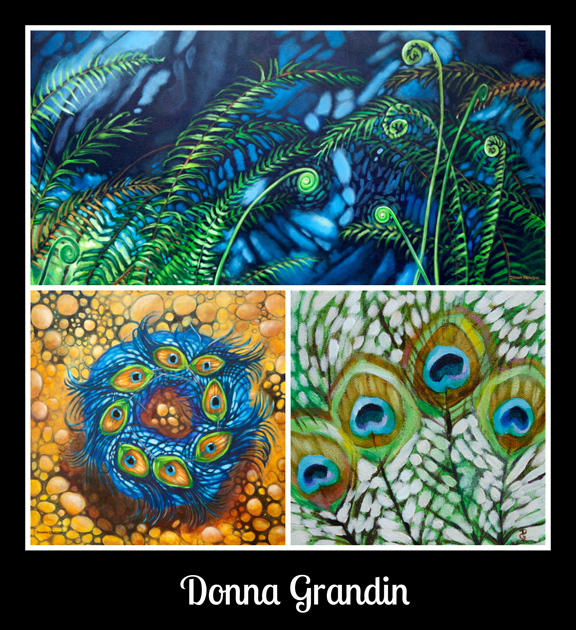 Some art from the “30 paintings in 30 days Challenge” that Donna did in Jan and Sept this year. A few of these little daily paintings sold during the tour, others are going to a new store opening later this month in St. Lucia. More details to come. Lois Shaw’s realistic still-lifes were very popular on the tour, as were her necklaces with slumped glass pendents. 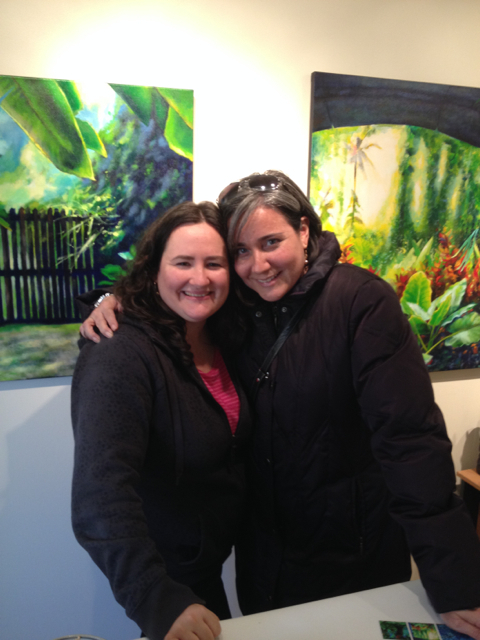 Unfortunately, Louise Young, the jeweller who was supposed to be the other guest artist in my studio, had to cancel. 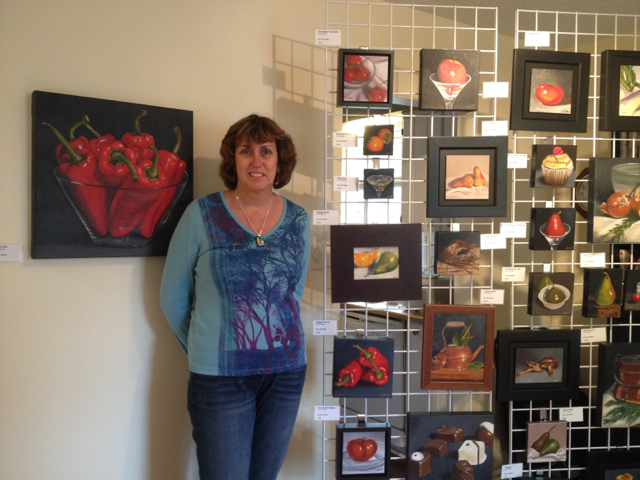 However Lois and I had more than enough paintings to fill the space. 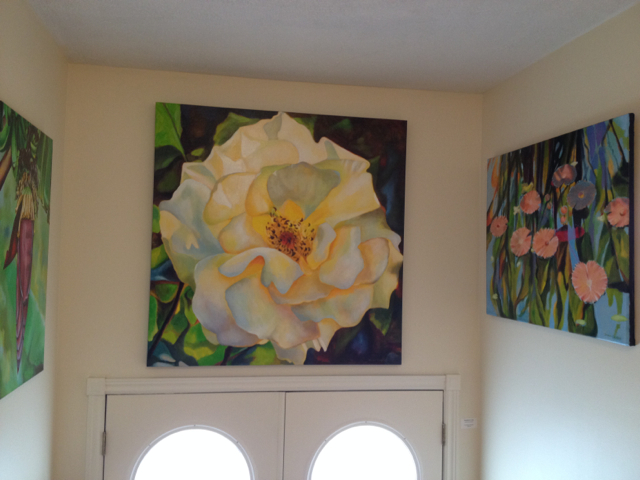 The rose painting above the doors was on my easel during last year’s tour. It’s 48″ x 48″, and so far it’s only been out of my studio for the Culture Days event. Thanks to Teresa Seaton & all the other Art in Action members who each contribute to making this event go smoothly each year. Some people came alone, some in pairs & others by the carload – or in this case a convoy of 3 cars! My cousin Patrice and her daughters came to show their support. And pick up some more of my blank art cards. 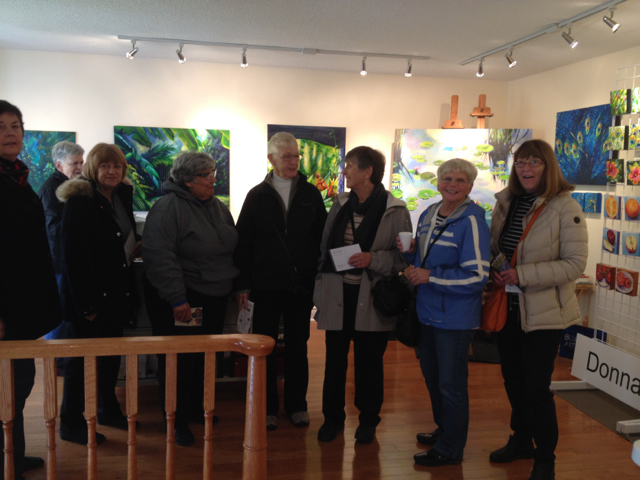 Ursuline & her friends came in from Toronto. Here she is putting her Christmas contest entry into the box. I decided I’m going to do a draw for a dragonfly painting (“Watching”), on Christmas day. There were entry forms available on the studio tour, for those who subscribed to my Blue Roots Art Studio Mailing List. Look out for other opportunities for you to enter the Christmas contest, through social media. There are refreshments at each of the studios, usually I make hot apple cider. There is still time to pick up something special for under the tree, just take a look at the paintings still available, and send me an e-mail to arrange pick-up/delivery. I am so excited for tomorrow, I will be painting OUTSIDE Burlington City Hall as part of Burlington’s Culture Days events which go from Friday through Sunday. I will be creating a new acrylic painting from noon till it is too dark to mix colors, but I will probably stick around till everything is done at 10pm. 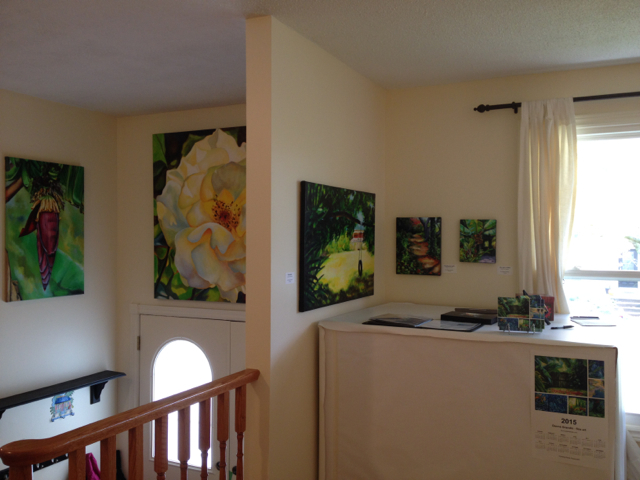 I am nervous because I plan on bringing some paintings to display in my booth (the City is providing a canopy, but it has no walls, so artist friend, Lois Shaw (she will be a guest artist in my studio during the Art in Action Studio Tour on Nov 1 &2) has offered to lend me her grids to hang the paintings. The weather forecast is very good for tomorrow, so at least I don’t have to worry about rain, but I am new to setting up outside, so I am also worried about wind and sun etc. If this event goes well though, I’ll consider applying to one or two outdoor exhibitions next summer. The truth is, when I initially signed on to do an Acrylic Painting Demonstration, I was very casual about it. After all, isn’t it just like painting in my studio, just outside … with other people watching? 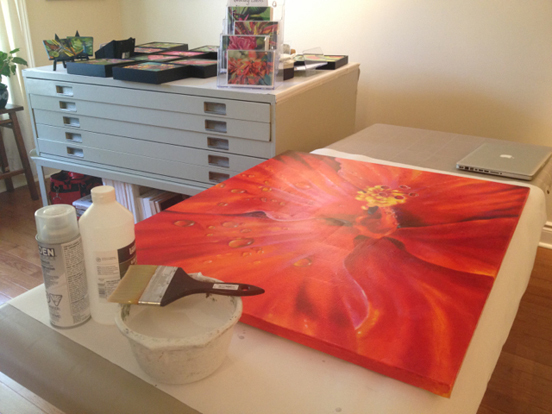 I often pack my gear up and go paint in a friend’s studio, a greenhouse, or even a gallery when invited. Then I heard about all the cool stuff the other Arts and Culture booths and individual Burlington Creatives are going to be doing, or displaying and I realized I really should take advantage of this opportunity to show the Burlington community more of my art. Somehow though, the idea of having all my stuff outside is a little terrifying. I have roped in my brother and his wife to give me a hand with setting up and taking down everything (endless trips back and forth to the car), but I am so used to having to do all this by myself, that it hasn’t really sunk in yet. Anyway read the Burlington Post article about what to expect tomorrow, in case you don’t get it delivered. And I hope to see you tomorrow!